This message is shown by the OS to allow our app permission to communicate with our chip seen on the USB bus. This message will be shown each time a new DisplayLink device is seen. Checking the "Use by default for this USB device" will prevent the message being shown again for that DisplayLink device. If you have multiple DisplayLink devices connected, the message will be shown multiple times, for each device. 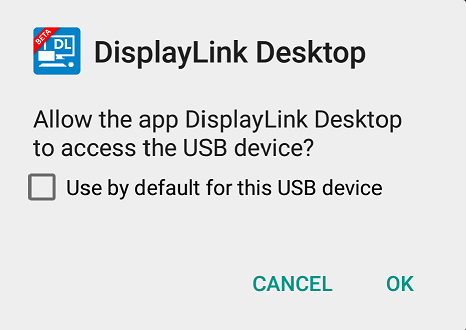 This message is shown by the Android OS to give permission for the DisplayLink app to capture the pixels from your tablet or phone display to be able to mirror them to the DisplayLink screen. 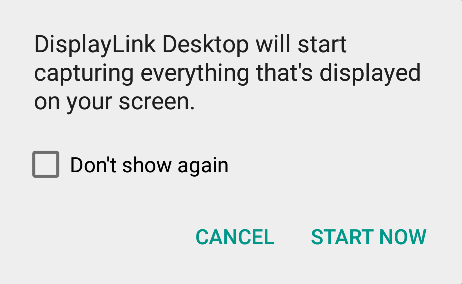 You will need to click "Start Now" to allow the DisplayLink app to display the contents of your phone or tablet screen on the DisplayLink display.